LAS VEGAS, NV / ACCESSWIRE / January 24, 2019 / Wrap Technologies, Inc. (the "Company") (WRTC), an innovator of modern policing solutions, reported that it hosted an invitation only demonstration of the Company's first product, the BolaWrap 100, to more than 25 representatives from distributors from 10 different countries on Wednesday. The areas represented included North and South America, Europe and Asia. "The interest and response to the BolaWrap 100 non-lethal solution from the international community has been extraordinary," said David Norris, Chief Executive Officer of the Company. 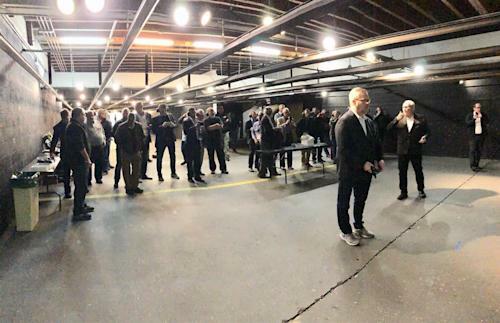 "We decided to invite selected prospective agents and distributors, many attending the 2019 SHOT Show, to a live demonstration of the product. Each also had the opportunity to deploy the BolaWrap 100 in person and meet our executive, sales and training staff." "After yesterday's successful demonstration, we will now begin a strict and strategic vetting process in order to determine the most effective distribution strategy in selected countries," said Mike Rothans, Chief Operating Officer of the Company. "Attendees were very impressed with the performance of the BolaWrap 100 and reiterated to us the international need for a new solution to engage with an increasingly non-compliant public." Since the Company began demonstrating the BolaWrap 100 in early 2018, representatives from more than 30 countries have reached out directly to the Company requesting demonstrations of the product and the opportunity to distribute to their respective law enforcement agencies. The Company recently shipped its first international order to Asia. The Company currently intends to implement a strategic international rollout of the BolaWrap 100 throughout 2019. Wrap Technologies is an innovator of modern policing solutions. The Company's BolaWrap 100 product is a patented, hand-held remote restraint device that discharges an eight-foot bola style Kevlar® tether to entangle an individual at a range of 10-25 feet. Developed by award winning inventor Elwood Norris, the Company's Chief Technology Officer, the small but powerful BolaWrap 100 assists law enforcement to safely and effectively control encounters, especially those involving an individual experiencing a mental crisis. For information on the Company please visit www.wraptechnologies.com. Examples of recent media coverage are available as links under the "Media" tab of the website. This press release contains "forward-looking statements" within the meaning of the "safe harbor" provisions of the Private Securities Litigation Reform Act of 1995, including but not limited to statements regarding the Company's overall business, total addressable market and expectations regarding future sales and expenses. Words such as "expect," "anticipate," "should," "believe," "target," "project," "goals," "estimate," "potential," "predict," 'may," "will," "could," "intend," variations of these terms or the negative of these terms and similar expressions are intended to identify these forward-looking statements. Forward-looking statements are subject to a number of risks and uncertainties, many of which involve factors or circumstances that are beyond the Company's control. The Company's actual results could differ materially from those stated or implied in forward-looking statements due to a number of factors, including but not limited to: the Company's ability to successful implement training programs for the use of its products; the Company's ability to manufacture and produce product for its customers; the Company's ability to develop sales for its new product solution; the acceptance of existing and future products; the availability of funding to continue to finance operations; the complexity, expense and time associated with sales to law enforcement and government entities; the lengthy evaluation and sales cycle for the Company's product solution; product defects; litigation risks from alleged product-related injuries; risks of government regulations; the ability to obtain patents and defend IP against competitors; the impact of competitive products and solutions; and the Company's ability to maintain and enhance its brand, as well as other risk factors included in the Company's most recent quarterly report on Form 10-Q and other SEC filings. These forward-looking statements are made as of the date of this press release and were based on current expectations, estimates, forecasts and projections as well as the beliefs and assumptions of management. Except as required by law, the Company undertakes no duty or obligation to update any forward-looking statements contained in this release as a result of new information, future events or changes in its expectations.